Today on one of the morning radio shows I listen to they were talking about doing a technology free Tuesday thing. Basically no phones, no tablets, no computers, no TV, nothing electronic. It is so you can spend more quality time with your family. They were doing it from 5-9 but we did ours from 4-8 because 8 is bed time. The boys and I worked on the puzzle G started a while ago and stashed under his bed. He got it from my mom for Christmas and the plan was for the boys to take turns with the puzzle board so when K finished his last one G would get to do his. The problem is K does a puzzle in less than a week and G never finishes. 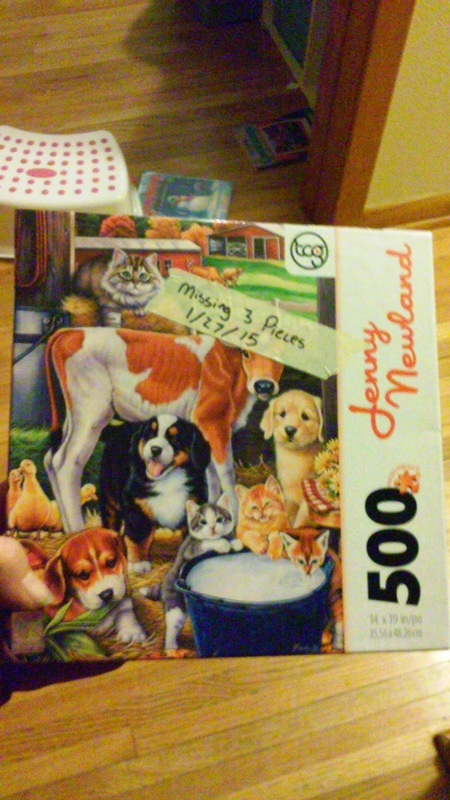 We got the puzzle done and then went in search for the 7 missing pieces. Both boys helped look. 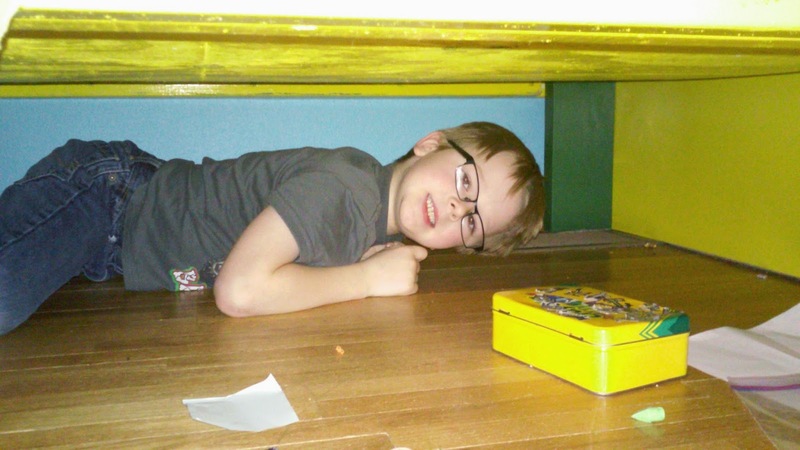 G searched under his bed because he is the only one who fits. K searched the closet. 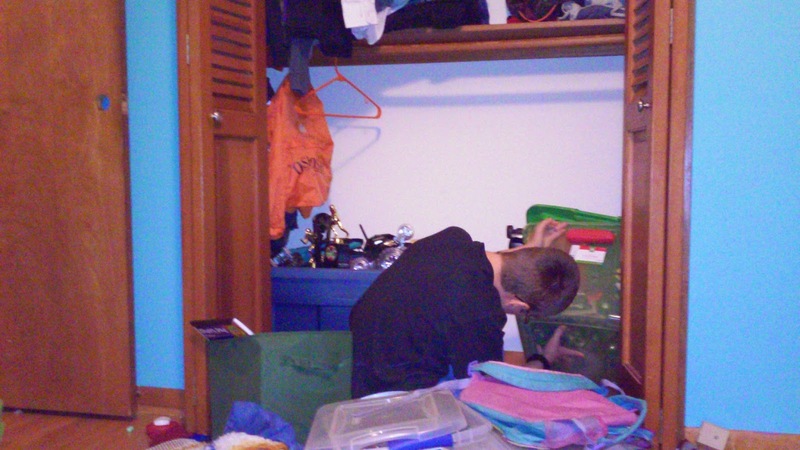 I would ask why he thought that a piece would be in the closet but, he found one in there so I didn't bother. We even searched in Z's toys. Now the puzzle is taken apart and back in the closet with a dated label saying that it is still missing pieces. We label them because if we ever find a piece it gets a bag with a label saying date found so we can try to make them whole again. 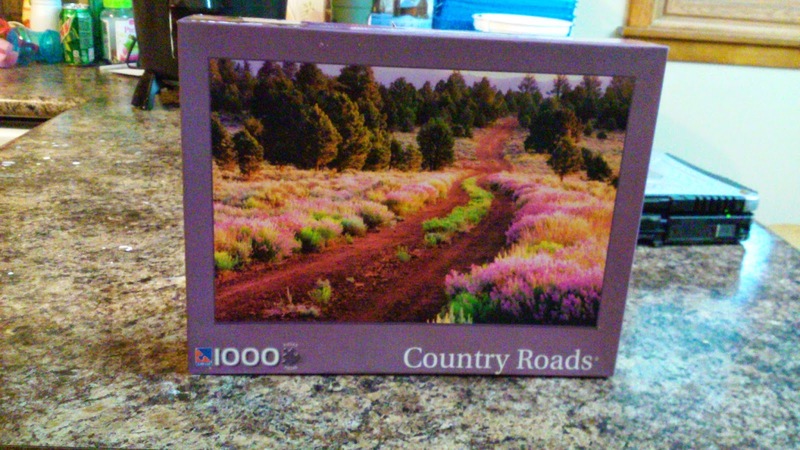 We date the box so we know if in 3 months so that if no pieces for that puzzle get found it gets used for art projects or it goes in the garbage. 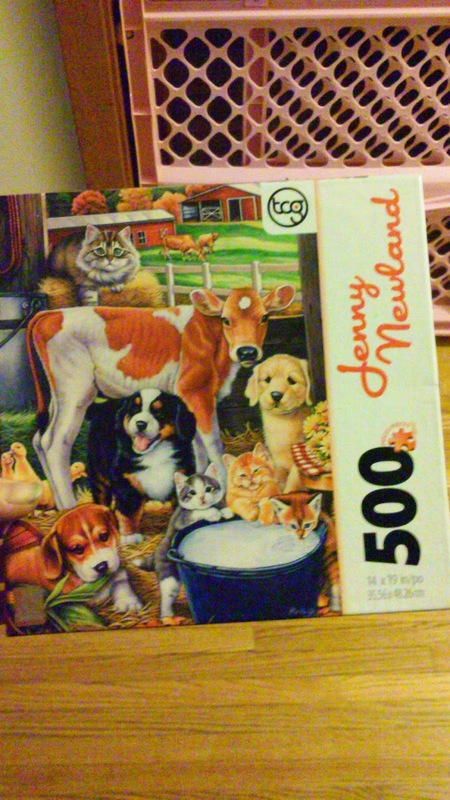 So we started another puzzle because we had some time to kill before bath and bed time. This one better not be missing any pieces because we just cut it open. G is bored already but K and I are enjoying the challenge. 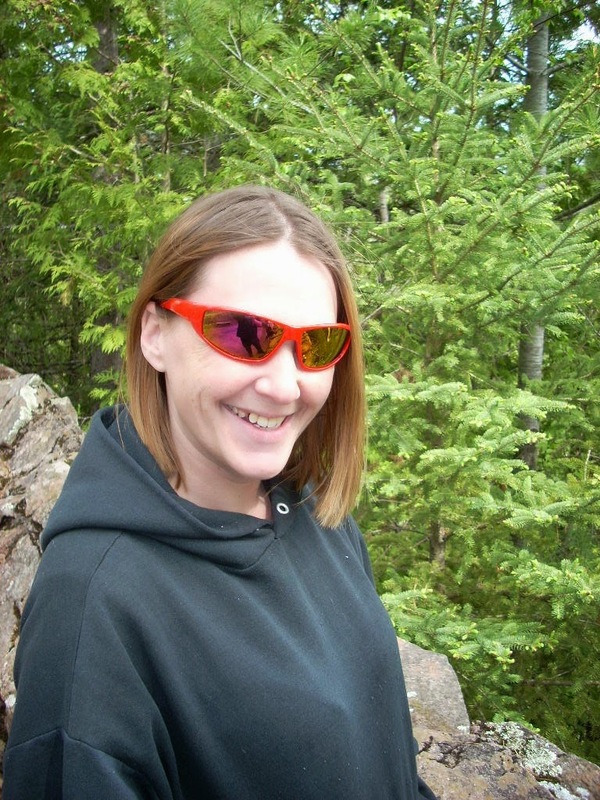 K and I have always enjoyed doing puzzles together because when he was small I was a single mom and had no money to do anything so we spent lots of time reading and doing puzzles together. I think that we both have missed that. 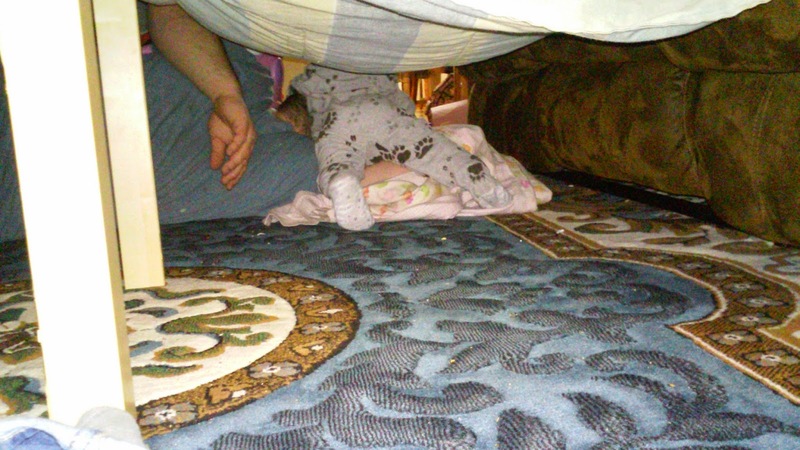 While the boys and I were doing puzzles Z and her daddy made a blanket fort in the living room. She is climbing over his head in the second pic lol. We have decided to make this Technology Free Tuesday thing a weekly occurrence at our house. It was so nice to spend time with the kids without the distraction of the TV and other electronics. Oh and today was day 27 without a cigarette! My one month splurge is already being planned in my head. I love Chipotle but just can't justify it in my budget so that is what I am going to do I think. I'm glad you guys enjoyed your tech-free night! It was hard when you could hear when you get a text but it was so worth it. 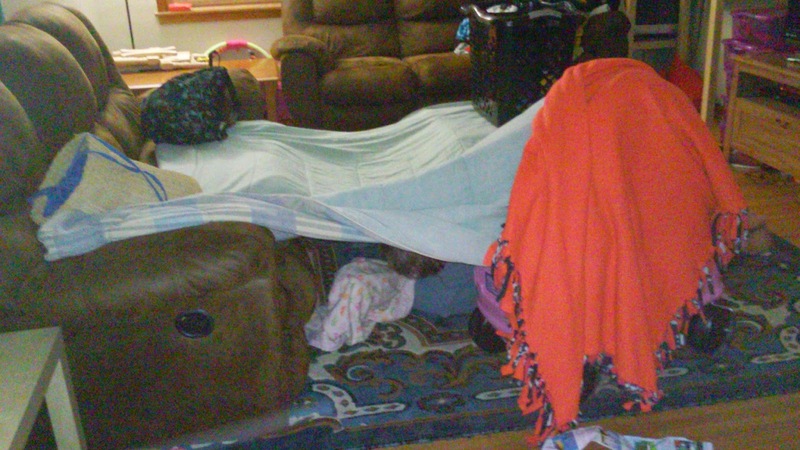 love the idea of a tech-free night, and it looks like lots of fun! Me too I think that I am going to make this a weekly thing.